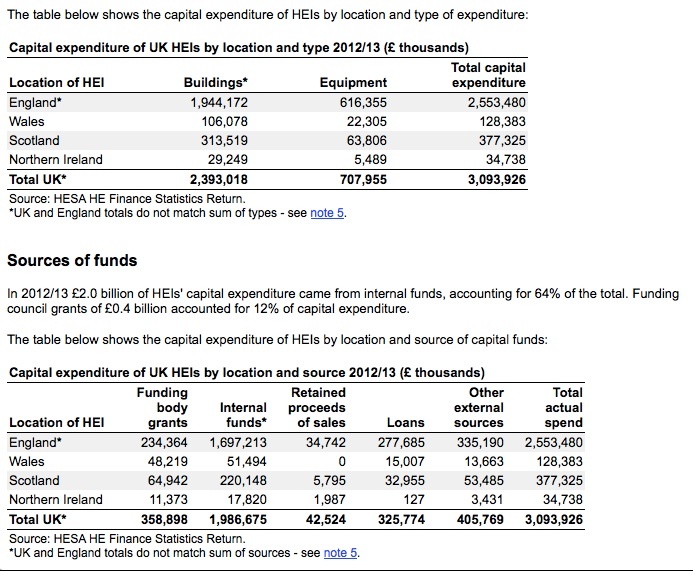 UK universities spent nearly £2 billion from internal sources for capital projects in 2012-13, up from £1.5 billion in 2008-09. The Finances of Higher Education Institutions 2012-13 report states that during the past academic year, universities’ capital expenditure was nearly £3.1 billion, 64 per cent of which was provided by internal sources. This compares with a total of almost £3.5 billion four years ago, of which 43 per cent was funded by internal sources. Expenditure funded by loans remained relatively stable, at £408 million in 2008-09 and £326 million in 2012-13, according to the data published earlier this month. Meanwhile, capital projects financed by funding body grants fell by about half over the four years, from £765 million to £359 million. So, despite the decline in funding agency contributions the total spend on buildings and equipment has increased significantly. Will capital spend continue to grow despite reduced public funding? We can expect so given the greater competition between institutions, the “arms race” of student facilities development and the need to invest ever more to support leading edge research.